Back in April last year we were able to host our most successful Betty Blocks on Stage (BBoS) event ever. That’s why we want to go even bigger and better this year (seriously, we wanted beer delivery drones but HR wouldn’t let us). Don’t worry though, we managed to pack the day with some epic events, plus we booked the best venue in town! 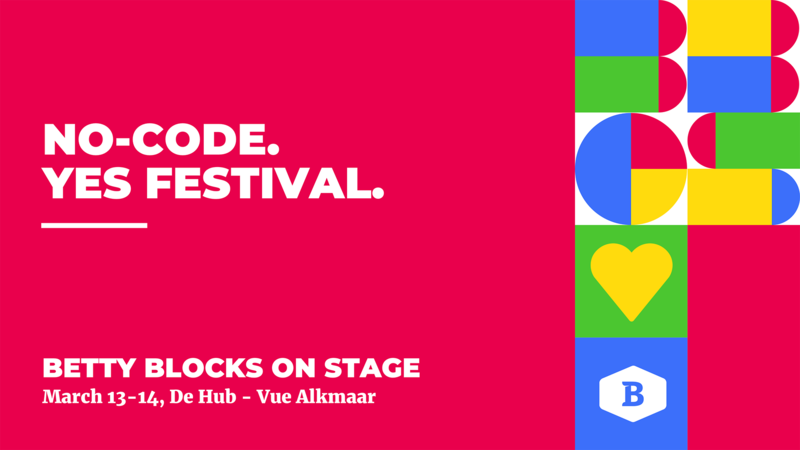 That’s right, our latest installment will be hosted in the fantastic VUE cinema in Alkmaar which gives us plenty of space to share all of the latest updates in the world of Betty Blocks and no-code programming. Last year we had the best in the game giving inspiring speeches about innovating with no-code. This time around Simon Hunt, an independent consultant for the UK Ministry of Defense, will be sharing his expertise in citizen development programs in organizations. Simon co-authored an eGuide on governing citizen developers, which you can download here. Chris Obdam, our CEO, will of course get you up to speed on everything Betty Blocks has in store for future developments. And finally, Nick Levy from Ernst and Young will be joining us with a deep dive into how to innovate from a corporate standpoint. There’s going to be no shortage of things to do, with plenty of mini-activities to choose from depending on what you want to see. Whether you want to head off to one of the break rooms for a quick massage or make some great new connections in the Meet & Greet room, we guarantee that this isn’t your standard IT event! Betty Blocks has developed the first ever truly no-code programming platform for anyone to use. BBoS gives us an opportunity to do a little show and tell! During the day we will be hosting live demonstrations of our platform to really show off how easily you can develop complex apps in no time at all, right in front of your very eyes! Staying true to our roots is a core value that we strive to maintain, with so many people that have helped us get to where we are. We would like to take the time to celebrate our partners’ successes. Their innovations inspire us to keep growing and developing new solutions. You mean there’s more fun than massages? Oh yes! Much more! What could be better than rounding off the day with a proper Dutch Borrel, with excellent food and of course plenty of drinks. BBoS is a celebration so don’t be shy to let loose a little. The day really is all about connecting so feel free to come and chat with us! We are extremely passionate about what we do and would love to answer all your burning questions. You will find us at the Genius Bar or come find us between talks. We would love to know more about you and what you’re doing. After everything is said and done, the main goal for BBoS is to make sure that you leave with a renewed passion for innovation as well as some fresh new ideas to throw into your success mix. Tickets for last year went super fast! So sign up below, we can’t wait to meet you! Watch this space for the full program.